Does your dog bark or howl when you leave them alone? What about peeing, chewing, scratching or even pooping? These are all classic signs of separation anxiety which can be a real problem, and can affect any breed. Some studies suggest up to 14% of dogs suffer from it. It also happens to be an issue that many dog owners misunderstand and try to treat in the wrong way. Because they fail to see the true cause of their dog’s behavior they tackle it in a way that will never work. And then they get frustrated that their efforts show no tangible results. Despite this, the real answer to curing dog separation anxiety is quite simple. The first step in knowing how to stop dog separation anxiety is of course to recognize the problem. To do this, you need to recognize the symptoms that occur when you leave your dog. And then ask yourself if the symptoms disappear when you come back. If they do, then it’s likely that your dog’s behavior is a result of separation anxiety. Chewing. When your dog chews, their body releases endorphins like the ones released when you chew gum. This calms your dog’s nerves and makes it feel better. This is why separation anxiety is often accompanied by chewing. Barking and howling. If your dog barks, howls or whines when you leave them alone, they’re calling for you to come back to the pack. They feel responsible for your safety and get nervous when you’re not there. Escaping. This can be an extreme symptom of separation anxiety in dogs, and can be dangerous too. Your dog escapes because they want to go and look for you. It’s easy to think your dog is escaping because they’re bored and need exercise and so giving them more exercise will stop the behavior. This won’t work though because the real cause of the escaping is your dog’s separation anxiety. Digging and destruction. Again, this kind of behavior is often caused by separation anxiety in your dog. When dogs are suffering from stress and are anxious they’ll often behave this way. Excessive licking, chewing themselves and drooling. These are all signs of stress. It’s easy to confuse these behaviors with medical issues but they’re most often a result of your dog suffering from stress. Bad toilet habits. If you’ve house trained your dog but they start peeing and pooping indoors, they could be stressed and anxious. If it only happens when you’re away, then it is likely linked to separation anxiety. There’s lots of advice around about treating each of these symptoms in isolation. And there’s also lots of information about dog separation treatment in general. But there’s only one real way to help your dog stop suffering from separation anxiety. You must establish yourself as the pack leader. The true cause of separation anxiety in dogs is that your dog thinks they’re the leader of the pack. They believe that you’re just a member of the pack and as such, it’s their responsibility to look after you. Before dogs were domesticated, members of dog packs didn’t just wander off alone. So when you do so, if your dog considers themselves to be pack leader they’ll be anxious and stressed until you come back. So make sure your dog knows you’re the real pack leader. Once you do this, your dog will have no problem with being left alone and their separation anxiety will be a thing of the past. 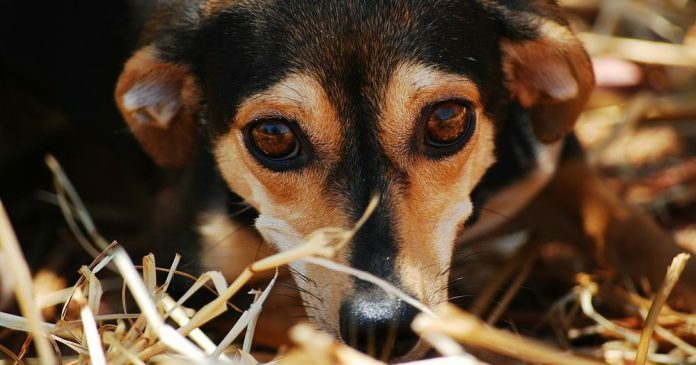 Understanding the true cause of separation anxiety in dogs is the first step towards curing it. Your dog considering themselves responsible for your safety is the true cause. Establishing yourself as the pack leader is the solution. So start working on becoming the boss today, and your dog’s separation anxiety will be a thing of the past before you know it. I have had to be a way from my dog, MATI, for almost 2 years. I had to have my leg amputated. A friend of mine was taking care of her. She was pooping all over. I tried to tell her it’s because MATI wants her mommy. I don’t think she believed me. Now, I know I am right.